When you're looking to create something truly delicious, visit Dotty's Bulk Food Basket. We offer a wide selection of great baking supplies, specialty foods, and products that can't be found anywhere else. 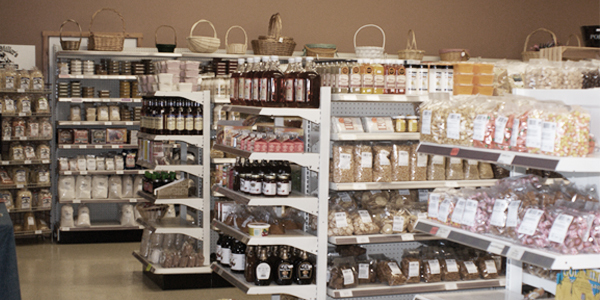 At our store you will find a full line of bulk food items including candy, nuts, pasta, spices, flour, and much more. We also offer a variety of organic and special dietary foods, and are currently expanding in these areas. From fresh ground all-natural peanut and almond butters to grass-fed buffalo and beef, we have something you will want to try. Don't forget to take a look at our homemade and scrumptious fudge that we make with real butter. With a wide variety of flavors, we have fudge everyone will want to try. We also carry a line of great gift baskets! Find something unique for yourself, or that special something for a loved one. We are also in the process of cycling out some of our gift section, in order to provide a range of great artisan crafts (brewing, cheesemaking, soap making supplies, as well as cultures). Our friendly and caring staff is always on hand to help you with any bulk orders, and answer any questions you have about our products. It is our dedication to our customers that makes Dotty's a great place to shop. Stop by today! Check out the online inventory of our main supplier Dutch Valley to view all of the items we are able to order in bulk with nutritional information. If you would like to make a bulk order, call us today!